One of the best things about the Internet is the resources available to do our own building projects. Whether we are assembling small planters or designing large patios, Americans can carry out their own build-it-yourself projects by searching for online guides and step-by-step videos. The popularity of DIY home improvement projects made us curious about what Americans are building on their own. To find out, we compiled some of the top “how to build” Google searches using SEMrush and analyzed them on Google Trends to find which states had the most interest in these building projects. We visualized our findings into some maps and illustrations. Below you’ll find what Americans are building in each state. What Are Americans Building For Their Homes? We first looked at “how to build” searches on the web with the highest search volume. When it comes to building their own things, Americans search most for outdoor and backyard projects. Deck building, in particular, easily outnumbers the other outdoor “how to build” Google searches. Indoor projects like shelves and fireplaces are searched less than outdoor projects. We also ran the most searched projects through Google Trends to where they were most popular. Of the 50 building projects we looked at, 19 of them (including greenhouse and barn door) were searched in Texas — the most in comparison to the other states. New York is the next state, with more interest relative to the others states in 12 of the searches. 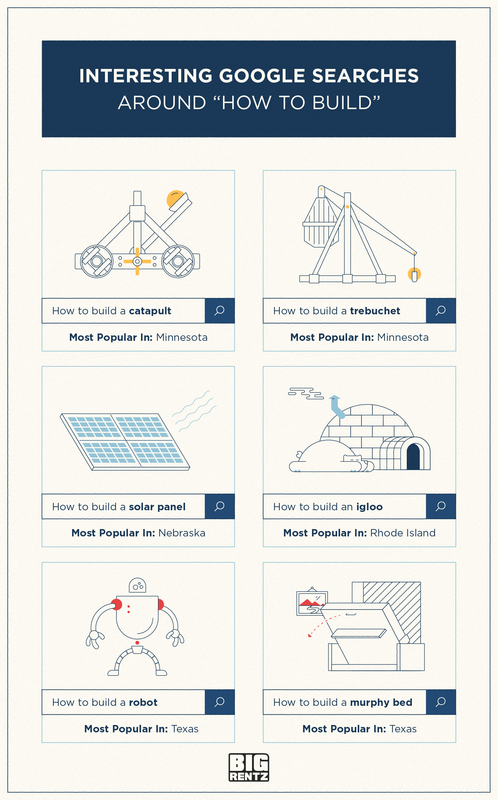 We then looked at the trending “how to build” searches in every state. Also among the most popular topics was “how to build a deck,” where residents of Alabama, Arkansas, Idaho, Iowa, Kansas, New Hampshire, Nebraska, and Louisiana had interest in building on their own. 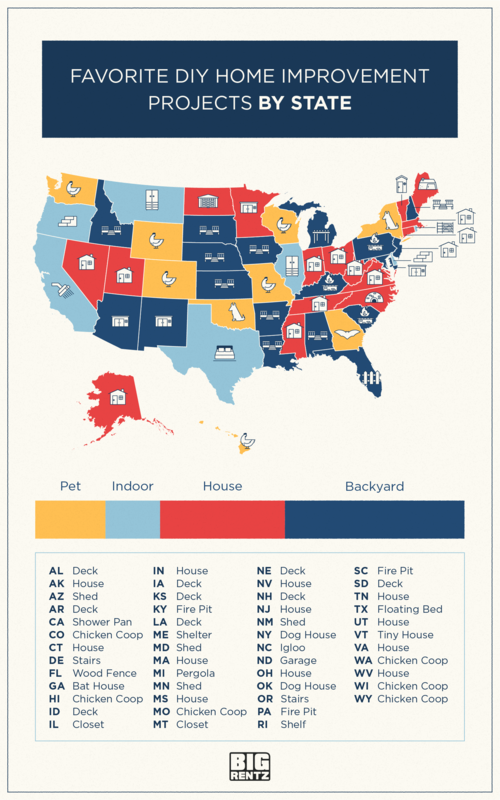 Interestingly, a fair number of states were interested in chicken coops. Although these searches were concentrated in more Southern states, the interest also went as far west as Washington. We were also curious what other things Americans were interested in building that were not related to home improvement. Computers, muscle, resumes, and Minecraft houses were the most popular, but our search also turned up interesting questions like “how to build a catapult” and “how to build a robot”. 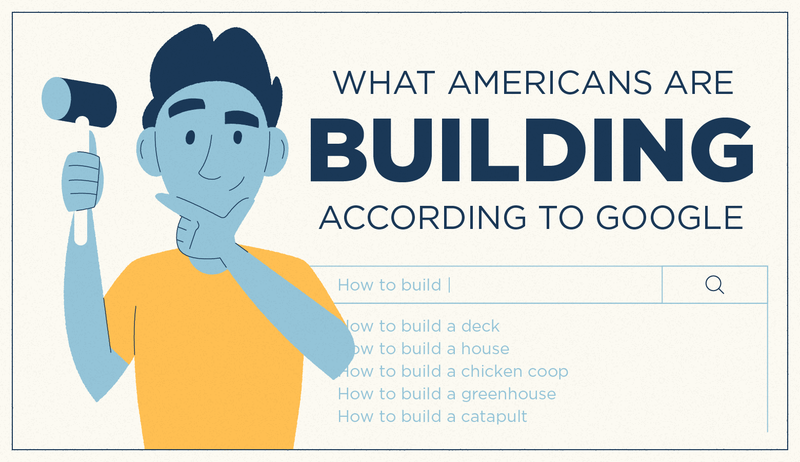 By looking at “how to build” searches, we get a closer look into what Americans are interested in constructing on their own. In particular, Americans are searching for instructions for their backyards with projects like sheds, decks, and even fire pits. This suggests that larger building projects are the types of things that we are looking to build, perhaps driven by our long human inclination to create things.